Mourners pay respects to PC Kerr in a ceremony that linked North and South in grief and defiance against what Cardinal Sean Brady termed “an evil deed”. PSNI officers carrying Ronan Kerr's coffin. THE FUNERAL OF PC Ronan Kerr has taken place in Co Tyrone. Ronan was killed in a booby-trap car bomb attack on Saturday in Omagh. At his funeral, Cardinal Sean Brady told mourners that his murder was “an evil deed” and “an offence against God”, the BBC News reports. Unfortunately, there are some who did not believe that Ronan should have joined the PSNI. They have a right to hold that view, but the freedom to hold that view also also brings with it a great responsibility. It brings the duty to respect the will of the overwhelming majority of the people. And the people have said no, never again, to the evil and futility of violence. And let there be no doubt that the killing of Ronan Kerr was totally unjustified. The funeral was attended by prominent figures from both sides of the border, including Taoiseach Enda Kenny, Northern Ireland’s first minister Peter Robinson and deputy minister Martin Mc Guinness. This is the first time Peter Robinson has attended a Catholic service. RTE’s Northern Editor Tommy Gorman told News at One that a raft of figures from the North and South of Ireland attended the funeral. They included David Begg of the Irish congress of Trade Unions, Jackie McDonald from the UDA, Deputy Micheál Martin, Garda Commissioner Martin Callinan and leading figures from the SDLP and Ulster Unionist party. Mr Gorman said that the coffin was carried down the Main St of Beragh by members of the local GAA club before being handed over to members of the PSNI. Then further up the street, some of the six best-known figures of the GAA took over, including Mickey Harte, manager of the Tyrone Co team, and Christy Cooney, the President of the GAA. They then handed the coffin to Ronan’s family members, who brought it into the church itself. The joint involvement of the GAA and PSNI is seen as a highly symbolic move that unites all those shocked by Ronan’s murder. Ronan loved life – from an early age when he was in the cot at the bottom of the bed where Cathair (his brother) slept – he would get Caithair to pull him out of the cot in the morning so that both of them could begin a day of high mischief. Seeing him sitting behind the wheel of the police car last weekend – I thought to myself – there is the symbol of the new Northern Ireland. Constable Kerr is survived by his mother Nuala, his brothers Cathair and Aaron and his sister Dairine. PSNI officers carrying the coffin of PC Ronan Kerr. The coffin of PSNI Constable Ronan Kerr is carried through his home town of Beragh in Co Tyrone, to the Church of the Immaculate Conception by colleagues. The coffin of PC Ronan Kerr, being carried to the church. The coffin of PSNI Constable Ronan Kerr is carried through his home town of Beragh in Co Tyrone, to the Church of the Immaculate Conception by members of the Red Knights GAA club. The family of PC Ronan Kerr, pictured on the way to his funeral service. PSNI Constable Ronan Kerr's mother Nuala and family follow Ronan's coffin through their home town of Beragh in Co Tyrone, to the Church of the Immaculate Conception where his funeral is taking place. 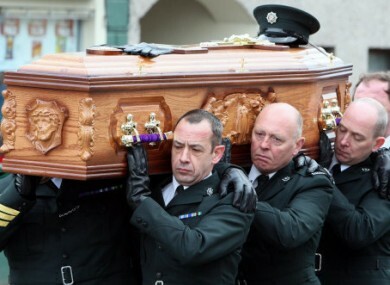 PSNI officers carrying the coffin of PC Ronan Kerr at today's funeral. The coffin of PSNI Constable Ronan Kerr is carried through his home town of Beragh in Co Tyrone, to the Church of the Immaculate Conception. Email “PC Ronan Kerr laid to rest in Co Tyrone ”. Feedback on “PC Ronan Kerr laid to rest in Co Tyrone ”.